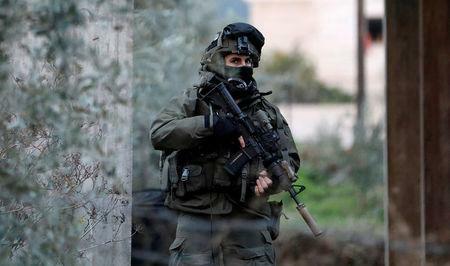 JENIN, West Bank (Reuters) - Israeli forces killed a Palestinian gunman and captured another in a clash in the occupied West Bank on Thursday, saying they were part of an Islamist Hamas cell responsible for an ambush in which a Jewish settler was shot dead. Two Israeli police commandos were wounded in the raid in the city of Jenin, a spokesman said. Such flare-ups have been rare in the West Bank, where Palestinian security forces last year resumed cooperation with Israel despite the stalling of negotiations on statehood. Palestinian officials said they had received conflicting information from Israel about the identity of the dead gunman. Another three Palestinians were wounded in the raid, they said. Witnesses said the Israeli forces had bulldozed at least one building, and that it was possible another gunman was buried under the rubble. Israeli Defence Minister Avigdor Lieberman said the Palestinians targeted in Jenin belonged to a Hamas cell that killed Rabbi Raziel Shevah, a West Bank settler, in a drive-by shooting on Jan. 9 and attempted a previous attack. "It is not entirely clear" if all members of the cell had been killed or captured, Lieberman told the Walla news site. Tensions in the region have risen since U.S. President Donald Trump's announcement on Dec. 6 recognizing disputed Jerusalem as Israel's capital, and at least 18 Palestinians and one Israeli have been killed since. "The cell in Jenin is not the first and will not be the last," Hamas official Sami Abu Zuhri said in a statement. "The criminal role of (Palestinian) security coordination (with Israel) will not succeed in preventing the resistance from confronting Trump's decision and protecting Jerusalem." In the interview with Walla, Lieberman said that Israel did not have Palestinian help with the raid. Trump's reversal of decades of U.S. policy has enraged Palestinians, who want to create an independent state including Jerusalem, the West Bank and the Gaza Strip. Israel captured those areas in the 1967 Middle East War and annexed East Jerusalem in a move not recognized internationally. It says the entire city is its eternal, indivisible capital. U.S.-led peace talks between Israel and the Palestinians broke down in 2014. A bid by Trump's administration to restart them has shown no real signs of progress. Vice President Mike Pence is due to visit the region from Jan 20 to 23.